The clip is from the pilot movie, the first adventure that Scrooge McDuck (David Tennant) goes on with Huey (Danny Pudi), Dewey (Ben Schwartz), and Louie (Bobby Moynihan). It’s a search for the lost city of Atlantis that turns into every horrible family road trip you’ve ever been on. You really get a sense of the different personalities at play. Scrooge McDuck is as curmudgeonly as you could ever want, but it’s the brothers and Webby (Kate Micucci) who really shine. Co-producer/story editor Francisco Angones and executive producer Matt Youngberg both stressed that their goal was to make each brother distinct in more than just shirt color. That’s definitely the case here—especially now that we know”Huey, Dewey, and Louie” isn’t just the easiest way to say their names, it’s their birth order. 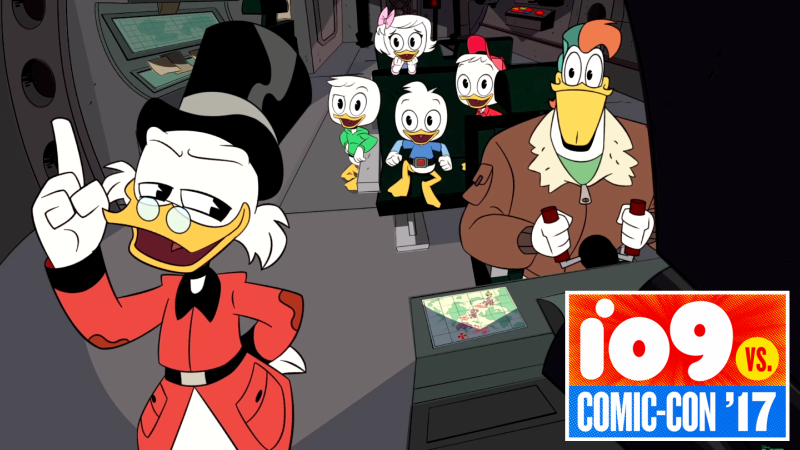 The DuckTales premiere movie is August 18, with the full series starting September 23.